"This is my variation on a recipe I found in a magazine. 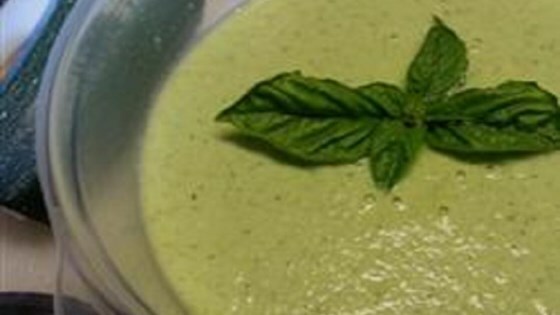 Garnish soup with fresh basil leaves and a drizzle of olive oil to serve." Blend cucumbers, zucchini, onion, olive oil, basil leaves, and lemon juice together in a blender until smooth; add cream, salt, and pepper and pulse until smooth. Refrigerate soup until chilled, at least 1 hour. Scallions can be substituted for the onion. Half-and-half can be substituted for the cream. I tried this recipe twice and it is such a nice combination of flavors I don't know that I'd change a thing. The basil is the perfect touch. I served this at a party and it was a huge hit. Holy cow, this is amazing! Made with zucchini and cucumbers from the garden, just a delicious summer dish.